To Cite: Karim Soltani M, Barkhori S, Alizadeh Y, Golfeshan F. Comparison of Debonding Characteristics of the Conventional Metal and Self-Ligating Brackets to Enamel: An in Vitro Study, Iran J Ortho. 2014 ; 9(3):e4842. doi: 10.17795/ijo-3739. Background: Brackets’ debonding without any damage to the teeth is very important. Objectives: The aim of this study was to compare the debonding characteristics of the metal conventional and self-ligating brackets. Patients and Methods: 69 maxillary premolars were randomly assigned in 3 groups. Metal brackets of Damon, In Ovation and conventional systems were bonded to the teeth. The brackets were debonded with debonding pliers. Debonding strengths, adhesive remnant index, and enamel damage were evaluated. 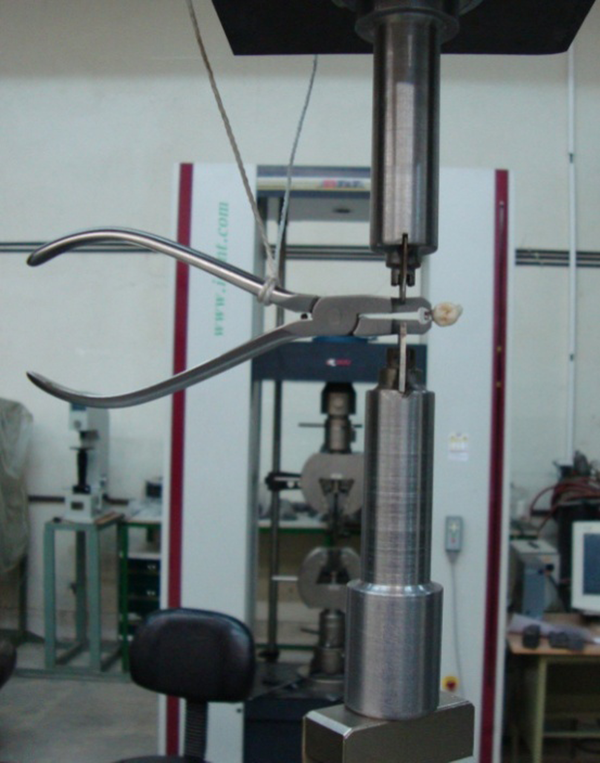 A Zwick model universal testing machine was used to measure debonding strengths. The debonding strength values were statistically analyzed by one-sided analysis of variance while the increase in the enamel crack numbers and length and the remained adhesive index were analyzed by chi-square test. Results: The means of the debonding strength in the brackets of in ovation, damon and conventional systems were 15.22, 11.4 and 8.67 MPa respectively. Significant differences were observed regarding debonding strength between three types of brackets (all: P < 0.001). After debonding of in ovation, damon and stainless steel brackets; the increased numbers of the enamel cracks were noted in 26.06%, 21.74% and 17.39% cases respectively. Also, the increased cracks lengths were demonstrated in 47.83%, 39.13%, and 30.43% cases. No significant differences were observed regarding the increase of the enamel cracks number and length and the amounts of residual adhesive on the teeth. Conclusions: The debonding characteristics of the metal self-ligating were comparable to the conventional brackets. At the end of orthodontic treatment with fixed appliances, bonded brackets and any remnant of adhesive must be removed from teeth surface (1). Maximum preservation of enamel surface structure during debonding the brackets and polishing the enamel surface is one of the orthodontic treatment goals (2). To achieve these objectives, correct debonding techniques are of fundamental importance. The instruments used for bracket removal, such as ligature cutter or debonding pliers and the armamentarium for resin removal, are important in this procedure (3, 4). Specifically the procedures that have been used to remove adhesive remnants could possibly increase the risk of enamel damage in the form of crack and grooves (5, 6). In debonding procedure bond failure can occur at the adhesive enamel interface or at the adhesive-bracket interface or within the adhesive (7). When adhesive failure between adhesive resin and enamel surface occur, a certain amount of enamel loss is almost inevitable (8). With the increased bond strength the bond failure location will be moved toward the enamel and adhesive contact surface (9). The retentive area of the bracket base, conditioning procedure, type of adhesive, bracket base design and treatment of bracket base are the some variables that affect bond strength (10). Many efforts have been made since 1909 to improve orthodontic brackets. Ceramic and plastic brackets have been introduced but both have shown disadvantages, (11) for example, the incidence of enamel damage following debonding of the ceramic brackets were relatively high and reported to be 20% (12, 13). Metal orthodontic brackets have demonstrated properties that are closer to ideal in regard to health of enamel surface after denonding the brackets and have been used most frequently for fixed orthodontic treatment (11). The increase use of self-ligating brackets in nowadays orthodontic practice due to their claim advantages such as improved treatment quality, patient comfort and etc made us to focus on these brackets. Self-ligating brackets usually have a smaller base and a thicker profile than do conventional brackets. Therefore, it was postulated that failure rate might increase with self-ligating. However, no significant difference was found from the meta-analysis (14). These contradiction led us to design an in vitro study to compare debonding characteristic of the conventional (MBT) and self-ligating (Damon and Innovation) metal brackets to improve enamel health during debonding in daily practice. The aim of this study was to compare the debonding characteristics of the metal conventional and self-ligating brackets. The sample consisted of 69 extracted maxillary premolars that were cleaned and stored in distilled water at room temperature. All teeth had intact buccal enamel and were free of carious lesions or restorations that may affect the enamel strength were excluded from the study. All teeth were completely scaled and rinsed to clean calculus, soft-tissue remnants and debris. The buccal surfaces of the specimens were observed using a stereomicroscope (Olympus, SZX 9, Japan) with a magnification of 10× to diagnose the previously existing cracks. For determining the severity and number of existing cracks on the teeth, photographs were obtained from the teeth’s buccal surfaces by a camera connected to the microscope. 3 types of brackets were investigated in this study. The teeth were randomly assigned to 1 of 3 groups, namely, group A, group B and group C having 23 teeth each based on type of brackets to be used. Metal Damon 3MX (Ormco, U.S.A) and In-Ovation (Denstplay; GAC, U.S.A) self-ligating brackets and MBT stainless steel (Denstplay;GAC, U.S.A) conventional type were used as a control. The teeth were randomly assigned to 1 of 3 groups, namely, group A, group B and group C having 23 teeth each based on type of brackets to be used. All specimens were cleaned using a rubber cup and pumice on a low-speed handpiece, and dried afterwards. The enamel surfaces of the teeth were conditioned with a 37% phosphoric acid solution according to the directions of the manufacturer. All brackets were bonded with a light-cured adhesive (3M, Unitek, USA); pushing firmly onto the conditioned enamel on the middle of the buccal surfaces with a manual scaler. Excessive adhesive material was removed from the bracket’s surrounding area. The teeth were light cured for 30 seconds. In the next, the brackets of three groups were debonded using a sharp-edged bracket removal plier (Dentaurum, Germany). To calculate the debonding strength; plier was held in the load-measuring device (Zwick) by means of two sharp-edged bars (Figure 1). The bonded brackets were placed between the debonding plier blades in the mesiodistal directions at the bracket-adhesive interface. Two grooves were created on the smooth surfaces of the pliers in the contact area with the bars to decrease the plier slipping risk during load application. The device exerted a compressive force on the plier at a crosshead speed of 1 mm/minute until the bracket separation. The debonding loads were measured in Newton and changed to Megapascal (MPa) by dividing the obtained values by the brackets’ bases (mm2). As the testing machine-loaded force was not equal to the actual debonding forces created in the interface of the bracket and adhesive by means of the plier blades, the observed force values were multiplied to a/b ratio to achieve actual forces at the plier’s blades. b = the distance from where the actual force is applied to the fulcrum of the plier. To calibrate the testing machine and the connected commanding computer, 5 test specimens were debonded at first. To assess the location of bond failure, we used the light microscope with the magnification of 10×. 1. All composite remained on the enamel surface and the bracket is free of composite. 2. More than 90% of the composite remained on the enamel surface. 3. More than 10% but less than 90% of the composite remained on the enamel surface. 4. Less than 10% of the composite remained on the enamel surface. 5. No composite remained on the enamel surface (15). The remaining adhesive was carefully removed from the teeth enamel surfaces using a low-speed handpiece. The buccal surfaces of the teeth were assessed by means of a stereomicroscope. The number and length of the enamel cracks were recorded and compared with those obtained before debonding. The debonding strength values of the brackets to the teeth enamel surfaces were statistically analyzed by one-sided analysis of variance test while the paired comparisons were done using a t-test. The changes in the number and length of the enamel cracks after debonding as well as ARI scores were tested by chi-square test. The debonding strength values of the studied brackets are depicted in Table 1. There were significant differences regarding debonding strength between 3 types of brackets (P < 0.001). Furthermore, significant differences were existed among all the bracket types when comparing to each other (all: P < 0.001). The frequency of increased crack numbers after the debonding in 3 bracket types is given in Table 2. Increased crack numbers were found in 6 (26.06%), 5 (21.74%), and 4 (17.39%) specimens in the brackets of in ovation, damon and conventional respectively. No significant differences were found regarding the increased crack numbers after the debonding between brackets of in ovation and damon (P = 0.5); in ovation and conventional (P = 0.36); and damon and conventional (P = 0.5). a The values are presented as No. (%). The incidence of the increased crack lengths in 3 bracket types is depicted in Table 3. Increased crack lengths were noted in 11 (47.83%), 9 (39.13%), and 7 (60.43%) cases in groups of in ovation, damon and conventional. No statistically significant differences were observed in terms of the increased crack lengths after the debonding between the groups of in ovation and damon (P = 0.38); in ovation and conventional (P = 0.18); and damon and conventional (P = 0.38). The ARI scores of the brackets of 3 groups are presented in Table 4. No cases showed ARI scores of 4 and 5 while the score 3 were found more frequently in all brackets. There were no significant differences regarding ARI scores between in ovation and Damon (P = 0.67); in ovation and conventional (P = 0.28); and Damon and conventional brackets (P = 0.66). It can be concluded that the debonding characteristics of the metal self-ligating brackets were comparable to the conventional ones. The metal self-ligating brackets can be used to achieve a safe debonding procedure in regard to enamel surface integrity in the orthodontic treatments. During bracket removal, bond failure can occur at the adhesive-enamel interface or at the adhesive-bracket interface or within the adhesive (16). As we said with the increased bond strength the location of bond failure will be moved toward the enamel and adhesive interface (9). Adhesive failure between the adhesive resin and the enamel surface cause a certain amount of enamel loss because of the micromechanical bond between the adhesive agent and the acid-etched enamel (8, 17). Some believe that in the case of higher bond strengths (more than 13.5 MPa) during debonding procedure; the enamel will possibly fracture (18). In the present study; the mean debonding strength of damon and in ovation self-ligating brackets were 15.22 and 11.4 respectively. The value for stainless steel brackets was 8.67. Therefore according to our results shear bond strength of in ovation brackets was found to be slightly higher than the enamel fracture risk range (13.5 MPa). On the other hand, a minimum shear bond strength proposed for a successful clinical bonding is 6 - 9 MPa (19). According to the present study, all the studied brackets showed necessary requirements for the clinical applications in terms of shear bond strength of the bracket to the teeth. Although; the shear bond strength of stainless steel metal brackets; used as control specimens; were significantly lower than metal self-ligating brackets (damon and in ovation). Some factors related to the size and design of the bracket base can influence bond strength (20). Cucu et al. (21) showed that with the increased diameter or size of the bracket base the bond strength will be increased. In our study the base’s area of conventional brackets is greater than self-ligating brackets but the bond strength of the first is lower that the latters that was in contrast to Cucu et al. (21) results. Bond strength values are influenced by different methodological factors such as thermal cycling tests, the device used for measuring bond strength, the direction of the applied force to debond the brackets, diversities in the specimen selection, the device crosshead speed, bracket type, standardization of the environment moisture, quality and quantity of the equipment and diversity in the selected methods and materials (22). Therefore, the results of the present study must be interpreted with care. Clinical debonding strength values maybe lower than in vitro results calling for more investigations to approve the present study findings (17). One of the main issues faced during orthodontic treatments is the incidence of enamel cracks following the brackets debonding. Some suggested that the method of brackets debonding may affect the size of the enamel cracks and the number of newly developed cracks (23, 24). In the present study, no significant differences were found regarding the incidence of the increased enamel crack numbers or lengths after the debonding procedure among in ovation, damon, and stainless steel conventional brackets. Using in ovation, damon and conventional brackets; the increased enamel crack numbers were found in 26.09%, 21.74%, and 17.39% specimens, respectively, while the increased length of the enamel crack after debonding were found in 47.83%, 39.13% and 30.43% specimens. As reported by Zachrisson et al. (23) 7.8% - 10.2% of the premolar teeth showed enamel cracks before the orthodontic treatments while this finding increased to 12.2% - 20.5% after the debonding. Heravi et al. (25) reported the increased length of enamel crack following debonding metal conventional brackets but he found no significant differences among different method of debonding regarding the enamel crack lengths. Bishara et al. (26) studied the debonding properties of mechanically-retained ceramic brackets. He reported increased incidence of the enamel cracks can be seen in17.98% of the spiceman (4). The authors reported higher incidence of the increased crack numbers with the increased bond strength among the studied brackets. The results of the present study cannot be compared to the latter one due to the different bracket types investigated. Habibi et al. (17) found no significant differences regarding the number and length of increased enamel cracks between ceramic and metal brackets. According to our research until now, there are not any studies in regard to comparison of bond strength and enamel crack between metal self-ligating and conventional brackets. Therefore we could not compare our results to the other studies. Adhesive remnant scores were assessed through observing amount of the remaining composites on the enamel surfaces and reported according to modified ARI index in the present study, to determine the bond failure location in the enamel, adhesive and bracket bases (26). In the present study, no significant differences were found among the different bracket types regarding ARI scores. ARI score of 1 (all adhesive remained on the enamel surface), reported for some specimens, is associated with the decreased risks of the enamel damage. ARI scores of 2 and 3 were reported for some specimens showing partial removal of the adhesive from the enamel surface. In the present study, there was no case of 4 and 5 scores; this suggests poor resin quality in the areas adjacent to the bracket bases or the failure of the mechanical lock between the mesh and resin following the movement of the bracket base. Bishara et al. (26) showed no ARI score of 1 during the debonding of mechanically-retained ceramic brackets using a plier (2); while in the present study, ARI 1 score was observed in 7.8%, 17.39% and 21.74% of in ovation, damon and conventional brackets respectively. Furthermore, ARI 3 score were reported for 73.91%, 65.22% and 52.17% of the brackets, respectively (27). It seems that bracket retention mechanism has an important role in the ARI (28). Adhesive removal is necessary to eliminate potential plaque retention and to restore the aesthetic appearance of enamel surface (29). On the other hand, adhesive removal from the teeth surface after the debonding may be difficult and time-consuming with a possible risk of enamel damage (30). Several factors such as type of adhesive resins and debonding instruments are related to amount of enamel loss (16). Authors’ Contributions: The present study was a postgraduate thesis, Mohammad Karim Soltani was the supervisor, Sadegh Barkhori and Farzaneh Golfeshan postgraduate students and Yoones Alizadeh had measured the bonding strength in the laboratory. Funding/Support: Hamadan Dental Research Centre provided the financial support.